Beek, Lucien, Alwin Kloekhorst, Guus Kroonen, Michaël Peyrot & Tijmen Pronk (eds.). 2018. Farnah. 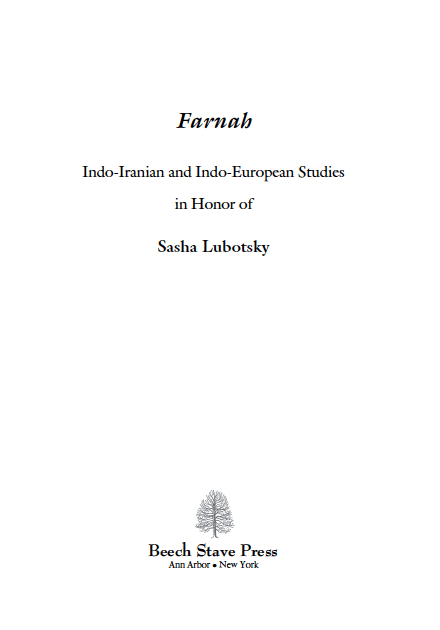 Indo-Iranian and Indo-European studies in honor of Sasha Lubotsky. Ann Arbor; New York: Beech Stave Press. Over thirty specialists in Indo-European linguistics have contributed this elegant volume in honor of Prof. Sasha Lubotsky of Leiden University. Besides giving an excellent snapshot of the research currently being undertaken by his students and colleagues at that institution, Farnah contains contributions from well-known scholars across the world covering topics in Tocharian, Germanic, Slavic, Indo-Iranian, and Anatolian linguistics, to name a few. Click here to see a full list of the contributions. Václav Blažek: The Case of Tocharian ‘silver’: Inherited or Borrowed? Gholami, Saloumeh. 2014. Selected Features of Bactrian Grammar (Gottinger Orientforschungen, III. Reihe: Iranica 12). Harrassowitz Verlag. Bactrian, the only Iranian language written in the Greek alphabet, was spoken in ancient Bactria in northern Afghanistan. It is an intermediary Middle Iranian language, possessing the characters of both Eastern and Western Iranian groups, and thus playing a very important role in the dialectology of Iranian Languages. Saloumeh Gholami’s study deals with various relatively unknown phonological, morphological and syntactical features of Bactrian and includes the following topics: historical phonology of Bactrian; the syntactical position of different kinds of nouns and their relationship in a sentence; the different types of pronouns and their syntactical properties; the function and syntactical position of prepositions and postpositions; adverbs and their formation; proximate and remote deixis adverbs as well as their different syntactic positions; various kinds of conjunctions and their functions; selected aspects of the verb; word order in clauses with transitive or intransitive verbs, and an investigation of double object constructions; as well as the different types of compounds. For more information see the ToC of this volume. Barbati, Chiara. 2015. Syriac into Middle Iranian: A Translation Studies Approach to Sogdian and Pahlavi Manuscripts within the Church of the East. Open Linguistics 1(1). 444–457. Based on a corpus coming from the Turfan oasis (in present-day Xinjiang, People’s Republic of China) and consisting of Christian Middle Iranian literature in several languages (Middle Persian, Syriac and Sogdian) and scripts (East Syriac, Pahlavi and secular Sogdian), the present paper is aimed at identifying and outlining the translation techniques for the transmission of religious knowledge, based on a literary tradition as well as on a manuscript tradition, from one context to another. The religious knowledge is that which belongs to the “Church of the East” and which is written in its official liturgical language, i.e. Syriac in East Syriac script. The general context is that of the missionary activities of the “Church of the East” along the Silk road between late Antiquity and early Middle Age. The particular context is that of the converted Iranian communities. 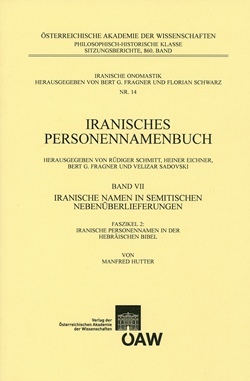 Chiara Barbati (PhD 2009) is a scholar of Ancient and Middle Iranian languages in the Institute of Iranian Studies, Austrian Academy of Sciences, Vienna (ÖAW).